Yesterday, after my morning class, I needed to go to do more interviews with the girls. It is always a bit of a juggle, finding a suitable time for an interpreter, when it suits the hostel parents and when the kids are not at school and when I am not in a class or shopping for food. 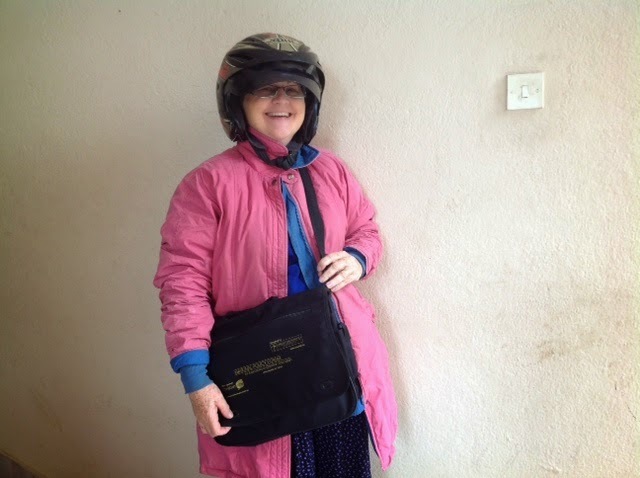 Anyway, when the time came it was raining and I was being collected on the bike. I was really looking forward to it, as I enjoyed it so much last time. Having no rain gear, I wore my winter coat and a broken helmet to keep my hair dry. So we made it, in the rain, through potholes full of water and the mad traffic. I still have more interviews to do so I will have another chance to ride through the streets of Kathmandu. Yahoo!!!!!!!! !